When you’re planning an overnight getaway, take a little time to pack a smart, versatile wardrobe and develop a wish list of to-dos to ensure no time is wasted. Aside from the one week-long vacation we take every summer, most of my trips are overnights or long weekends. I’ve found that those shorter trips require a little more strategic planning than the longer ones because there’s no wiggle room to allow for missed opportunities. 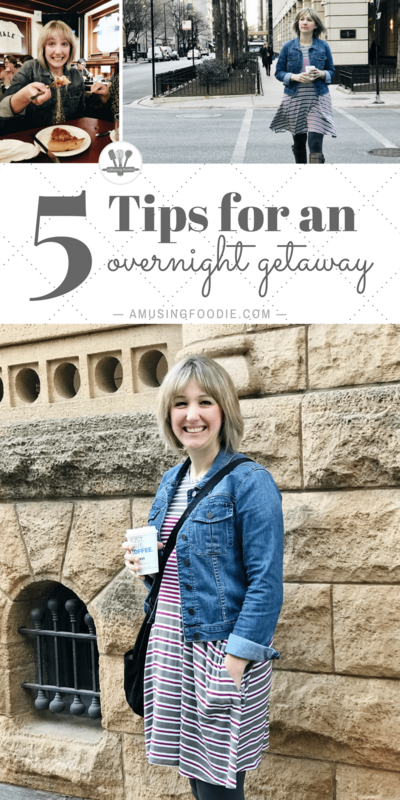 The good news is, it’s easy to do a little simple planning ahead to produce a fun whirlwind overnight getaway. These five tips have worked well for me! 1. Pack a versatile wardrobe. The fewer bags I can bring, the better, so I like to plan pieces that travel well and can be mixed-and-matched. On a recent trip to Chicago, I was there for less than twenty-four hours and only had a carry-on. I packed two super cute dresses from the spring Aventura line, a denim jacket, go-to Aventura leggings and greyish-brown riding boots. The denim jacket and boots went with both outfits, which meant I didn’t have to think much about getting dressed and could instead focus on getting ready to enjoy the experience. And, not only was I comfortable walking around downtown, I was just as comfy traveling to the city and back—with zero need for an iron. One of my favorite things about my Aventura pieces is how well they go with each other, as well as other pieces in my wardrobe! 2. Read up on recommendations from locals. Between numerous ways to solicit recommendations on social media (Facebook happens to be my favorite), bloggers who write about experiences visiting or living in your destination, or online review sites like TripAdvisor®, there are plenty of options to hone in on the best things to do in any given city. Sometimes the decisions are simple! For example, on my first visit to Chicago, I knew I had to experience true deep dish pizza, so I asked some local friends where to go and then we ended up at a favorite historic restaurant (see number four). It’s also a great way to figure out which part of the city to stay in, particularly if you don’t plan on driving or if there are lots of neighborhoods or sections, and things to do beyond restaurants and food-focused destinations … which happen to be my favorite. 3. Stay in the center of the action. Once you figure out where to go, pick lodging that’s right in the center because, for a short trip, not spending time traveling from one place to another is key! Could be that a hotel meets your needs, but lately I’ve preferred using Airbnb or HomeAway to find small apartment rentals. On my last trip to Brooklyn I stayed in a basement flat in a Brownstone around the block from my sister’s place. It was modern and charming, and had a full kitchen, which meant the option of cooking-in instead of having to eat out, or get take-out, for every meal. This summer I’ll be doing the same thing when I take my daughter to her dance nationals at Virginia Beach—a better experience and way less expensive than a hotel for a week’s stay. Brownstone basement flat in Brooklyn. 4. Choose one or two must-do things. By the time you’ve decided on a destination, you probably have at least one thing in mind that you’d like to do. But, whether you do or don’t, it’s still a good idea to sort them out before you go. When you only have a day or two to enjoy the place, you don’t want to use up precious hours debating one landmark over another. In Chicago, that was experiencing a true deep dish pizza destination—we ended up at Lou Malnati’s on Wells—and having the pie in an authentically-topped way (butter crust, sausage layer, cheese and sauce). My sister and I have a food bucket list in a shared iPhone Notes we use when I come visit her in Brooklyn. The restaurants are sorted by neighborhood so we can maximize our time and, basically, eat as much food as possible while travelling the least amount of distance. Anytime we hear someone mention a great spot, or see a video while scrolling through Facebook one of us adds it to our list—which is how we stumbled upon Raclette NYC and all that ooey-gooey cheesy goodness. 5. Decide on a spending budget and stick to it. After you know where you’re staying and have a few ideas in mind for things to do, take a little time to figure out what you’re willing to spend after the cost of lodging and transportation. Maybe you’ll have one nicer meal and hit local food trucks for cheap eats the rest of the time. Could be that you visit free museums, but pay for a theater performance. It’s good to know going in how much you want to spend (include allowance for a splurge here and there!) because unless your budget is limitless (mine certainly isn’t), the high of enjoying your getaway will quickly plummet to a low of not being prepared to pay for the necessities when you get home. This post was sponsored by Aventura. Use the code AmusingFoodie20 to get 20% off your order (limit one use per person)—good for regular or sale items, as well as on Ecōths!